Reminder to get registered ASAP. Last second to finalize your early registration is 2:59.59 PM CST on Thursday, December 15. Don't mess up and be stuck on the sidelines for easily one of the top 7 best races Humboldt Park has had in a year! 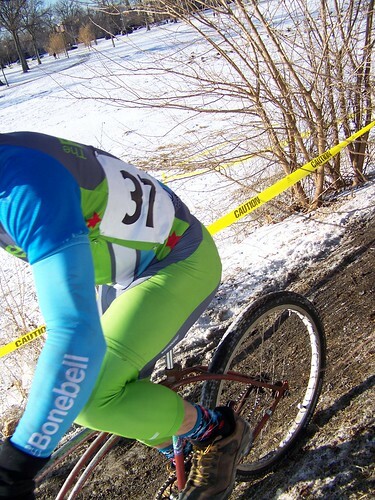 For first timers and any others without a 2011 USAC annual license, the Category 4 race in your gender OR the Fatbike Etc. is the one to sign up for. There is an extra fee of $10 to acquire a daily license issued through USAC and that transaction can be done when you come in to pick up your race number. If you ever wanted to try a bike race, this is your race. Trust. You can show up on a mini bike with flat pedals wearing a muumuu and 17 year old Nikes - you are GUARANTEED to catch way less a razzing than either of these two. In fact, we actually honor those that come out and race for their first time.